Trimble just launched Tekla Structural Designer, the most updated product included in its portfolio of model-based solutions towards the AEC industries. Tekla Structural Designer integrates analysis and design into an individual, flawless process to make the modeling process superior. 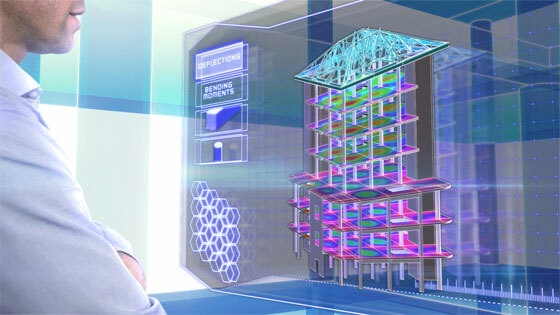 Tekla Structural Designer empowers the engineers to evaluate and design multi-material buildings with improved loading and analysis functionality, completely automated design, superior quality documentation and uninterrupted Building Information Modeling (BIM) collaboration in a superior way which will save huge time, reduce costs for engineers. With Tekla Structural Designer, the engineers can get rid of the problem for reproducing an integrated model from the beginning as they are capable of performing from the equivalent analysis and design model during the whole process. By incorporating Trimble's powerful 3D modeling software with Tekla Structures, Tekla Structural Designer offers more collaborative BIM processes. Tekla Structural Designer offers useful features to make the concrete and steel design process better. The engineers can instantly evaluate various alternative design schemes as well as efficiently deal with changes and work together impeccably. Produce a single analysis and design model that reduces the need for post-processing analysis results. Completely automatic loading and design contains wind loading and finite element analysis for speeding up the design times. Automate the process for creating product documentation, facilitating engineers to undertake up to date decisions at each phase. Users can rapidly generate and compare numerous design options for establishing the most competitive scheme and consequently submit bid for more projects. All the modifications can be easily handled for shortened response time at any phase of a project, and utilized across the whole model to immediately appraise impact and automatically obtain a re-design quickly. Calculation reports are updated automatically and the users don’t have to produce new reports by hand if any modification occurs. If required users can coordinate models across teams several times keeping the crucial design data intact. Additions, modifications or removals can be viewed by integrating with strong auditing tools, minimizing the risk of errors to a great extent. Smooth and continuous amalgamation with Tekla and other BIM software make the communication and collaboration better within the structural design office and other project stakeholders like technicians, fabricators and architects. Tekla Structural Designer is supported with a range of services ranging from local technical support through qualified structural engineers and an online knowledge base with learning materials. For getting more updates, visit: www.tekla.com/tekla-structural-designer.